Sister Margaret Rourke was born on a very cold night, Dec. 23, 1927, at her family’s farm home, 11 miles northwest of McCracken, in the southeast corner of Trego County. She was baptized, Margaret Louise, at St. Mary’s Church in McCracken on Jan. 14, 1928. She was the fifth of seven living children. Her mother and the others tried to explain that they would never get finished. “We will go every Sunday every year all the time.” She said that was unfathomable to her, but it caused her to ponder who this God might be and what was he like. One of the things she said she really lacked was social interactions with children outside her family and relatives. She went to a one-room school with about 10 students. She had one classmate through third grade, and that classmate was her cousin, Marjorie Rourke. After third grade, Marjorie’s family moved and Margaret was the only one in her class. However, she said her high school years were a good contrast. When Margaret was ready for high school, her two older sisters, Lucille and Eileen, who had stayed home a year to help during their mother’s illness, were ready for their junior and sophmore years. The three of them stayed at an apartment that her family rented in Ellis and went to school there. After high school, Margaret went to Marymount in Salina. She said that she felt early in her time there that she might be called to religious life … but she waited until the end of the year to talk about it just in case a young man might sweep her off of her feet. In the end, God’s call was clear. Margaret entered this community of St. Joseph on March 19, 1947 … 71 years ago. On March 19, 1948, she received the habit and the name Sister Mary Thomasine. Living band members are Sisters Christella Buser, Vivian Boucher and Mary Savoie. Her first mission was Tipton where she taught grades 1, 2 and 3 (about 45 children). Sister Christella, who was in her band, was also in Tipton for the same five years. Her second mission was Leoville, where she taught the same grades but had only about 26 children. Also on that same mission in Leoville was Sister Ann Louis, her principal. The two of them became lifelong friends and supported each other in all areas and especially in their spiritual journeys. After two years in Cawker City, she was assigned to Sacred Heart High School to teach math which was a real stretch for her. But the biggest stretch was going to St. John’s High School in Beloit to teach biology, chemistry and physics. She had taken one course in chemistry seven years earlier and five hours in biology in summer school. With Sister Marie Kelly’s help she survived. 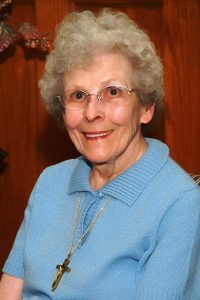 Eventually, Margaret took a position in adult education and parish ministry at Queen of the Holy Rosary Parish in Overland Park, Kan. This position lasted for 12 years, and as in all of her ministries, she continued to grow in zeal and in her life with God. Throughout her life Margaret was courageous in the cause of justice and relentless in the alleviation of poverty. In her “retirement” from active ministry she was mission coordinator for Appeals for our Brazilian Sisters. This she did with the same enthusiasm and diligence as she did everything else. For ten-plus years she organized parish presentations and did many of them herself. When her presentations took her to western Kansas or to Colorado she loved to spend an overnight with her family. Margaret also maintained a close relationship with her family over the generations participating in and planning many family reunions and celebrations and being of help and support whenever someone needed her. Margaret was very close to her nieces and nephews. In these past years she has been a pivotal point for her nieces, who have loved to come here to Concordia from their various home bases to dote over and stimulate Margaret … and to find time to nourish their own relationships with one another. The sisters here in Concordia have also benefited from the joy and fun they bring. Spring into a new Messenger! 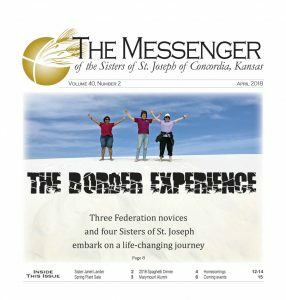 The April edition of The Messenger is always an exciting one, and this year is no different. We have Sisters and Novices at the border, a Spaghetti Dinner recap, exciting news from the Marymount Alumni Association and a calendar bursting with activities for the future. Sister Therese Richstatter was born on Dec. 21, 1929 in the Clay Center Hospital. She was the youngest of two children with a sister named Frances who was a year and a half older than herself. Her parents were Edward and Martha (Klemm) Richstatter and they lived on a farm south of Greenleaf, Kan. She was baptized in St. Michael’s Church in Kimeo and given the name Anna Elizabeth. Kimeo, at that time, was a thriving and faith-filled community centered around the Catholic Church. There were families on practically every section and most of the families were large. There were two masses on Sunday morning and the Church was full for both masses. The Church was (and still is) large and beautiful, its steeple can be seen for miles around. Anna and her sister attended a one room school half a mile from their home. On Saturdays they attended religious instructions. The Sisters of St. Joseph taught religious vacation school every summer in Kimeo. It was there that Anna first met our sisters. She and Frances received their First Holy Communion together. Anna had just completed first grade. The only surviving members of her band are Sisters Alice Marie Stalker and Rita Ann Mazanec. Therese graduated from Marymount in 1967. She then earned a Master’s Degree in Theology from St. Mary’s University in San Antonio, Texas. During her studies there she wrote a paper titled: “Love in the Epistles of Paul” I will quote from that paper later and that is why the readings tonight and tomorrow at Mass are from St. Paul and on love. 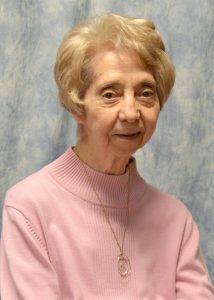 Therese loved her years of teaching, and said that one of her favorite years was her first mission year at St. Joseph and Ann School in Chicago. She also taught at Concordia, Clyde, Cawker City, Grand Island, Booneville, Tipton and Salina. She particularly enjoyed preparing students for First Holy Communion. She also enjoyed being Sacristan, and later, Eucharistic Minister and taking communion to the sick wherever she was missioned. In 1987 she earned a Master’s Degree in Library Science from Emporia State University and then was librarian at Our Lady of Guadalupe School in Topeka. She had a great love of learning and was very well read. Of her own spirituality, Therese said: “My experience of God is a constant presence, who has always been there in my life as long as I can remember”. Is this not also an apt description of our ministry of presence? Therese also, over the years of her ministry, engaged in many activities as volunteer and this speaks to her love and compassion for people. She taught religion in Huntington Beach, Calif., in a program called Sonshine. She also taught reading in a summer enrichment program on the Oneida Indian Reservation in Wisconsin. In Topeka, she volunteered at the public library and the Better Business Bureau, taught RCIA and passed mail on Saturday mornings at St. Francis Hospital. At Medaille, she volunteered in the Green Thumb Program. Therese, your wisdom, knowledge, sense of humor and your givenness have enriched us all. We are grateful for your life among us and know that now you are totally in God and present to us and encouraging us in all ways. I would like to close with a blessing from St. Paul’s letter to the Ephesians, chapter 3, verses 17-19. So that you may attain to the fullness of God”. Let us tonight, not only pray for Sister Barbara, but also reflect with gratitude for her life among us as a Sister of St. Joseph. I ask you to walk prayerfully with me during the next 20 to 30 minutes as I present a review of her life, first a biography, secondly information about her education and ministry experiences, and thirdly, and perhaps most important, some of the wonderful and touching inspirations Barbara leaves with each of us. Aurelia Marie Bader was born, seventh of a family of nine children, January 13, 1923, on a farm in Rhineland, Mo. Her father, Leo Bader, and mother, Petronilla Buecker, raised four sons, Aloysius, Urban, Jerome and Henry, and five daughters, Theresa, Genevieve, Aurelia, Barbara and Nellie. Nellie is currently the only family member remaining and living in Giltner, Neb. Aurelia Marie Bader, at the age of 19, on May 9, 1942, entered the Congregation of the Sisters of St. Joseph of Concordia, Kansas. On March 19, 1943, she received the religious habit and the name of Sister Mary Barbara. She pronounced her first vows of poverty, chastity and obedience on March 19, 1944, and her final profession on August 15, 1947. After completing her novitiate, Sister Barbara earned a B.A. from Marymount College in Salina, Kan., and a M.A. in Educational Administration and Counseling from Notre Dame University in South Bend, Indiana. Sometime later, she completed training in psychology and became certified in counseling and as a spiritual director. Sister Barbara’s ministries of teaching and serving as a principal took her to Chicago (1945-50) where she taught first-grade students; to Cawker City, Kan. (1951-54) to teach first through fourth grades; and to Damar, Kan., to serve as principal and teach first and second grades. 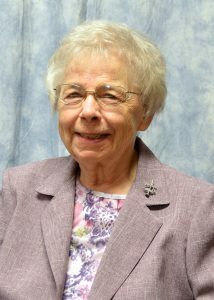 In 1962, Sister Barbara was instrumental in establishing a new Catholic school in Oakley, Kan.; from 1968-71 she served as principal of the Catholic school in Beloit, Kan., and principal of the Catholic school in Manhattan, Kan., from 1972-79. Her final active ministry was in Grand Island, Neb., from 1984-2003 where she served primarily as Director of Religious Education. 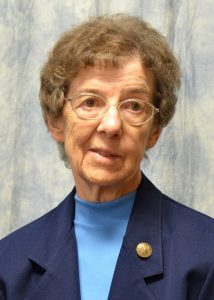 In addition to all of this, during the last 12 summers of her active ministry, Sister Barbara served as Spiritual Director during retreats at the Jesuit Retreat Center in Sedalia, Colo.
What was the driving force which propelled Sister Barbara through so many years of dedicated service to the dear neighbor? 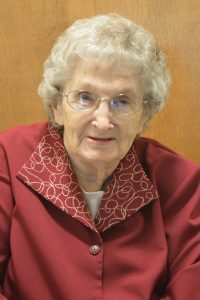 Visiting personally with her during those years of her living at the Motherhouse and at Mount Joseph Nursing Care Center, and being able to read and reflect on the personal notes she kept during retreats, gave me a glimpse of an answer to that question. Thank you, dear friend, Sister Barbara Bader, for your life and love. Tickets are now available for the 2018 Sisters of St. Joseph Spaghetti Dinner, the biggest event of the year at the Nazareth Motherhouse, 1300 Washington, Concordia. 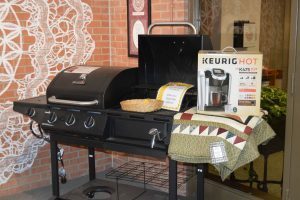 A winning raffle ticket could win the owner a new CharBroil grill, a hand-crafted quilt, a Keurig machine or cash prizes. The dinner is set for Sunday, March 18, with dinner being served from 11 a.m. to 1:30 p.m. Advance dinner tickets cost $8 for adults and $4 for children ages 5-12, and are available at the Motherhouse, at Manna House of Prayer and at Neighbor to Neighbor. They are also available by calling the Sisters of St. Joseph Development Office, (785) 243-2113, ext. 1225, or emailing agilliland@csjkansas.org. The theme of this year’s spring fundraiser is “Follow the Yellow Brick Road,” and it features activities for the entire family, tours of the historic Motherhouse and performances by local musicians. There will be drawings for prizes of up to $500 cash, a silent auction and the popular “grab bag,” with gifts for $1, $2 and $3. Homemade baked goods and Easter baskets will be available for sale. 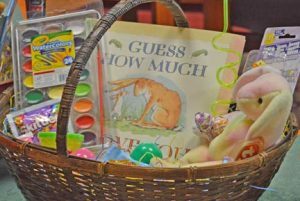 A variety of Easter baskets will be available for purchase. Throughout the event, the Nazareth Gift Shop will be open. Tickets for the drawing cost $1 each, or six tickets for $5. Ticket holders in the drawing choose which prize to try for. This year there are cash prizes of $500, $200 and $100, plus a CharBroil gas grill, a Keurig coffee maker and a 69” x 84” quilt constructed by Sister Betty Suther and hand-quilted by Sister Ann Glatter. Winners will be drawn about 1:30 p.m., but you need not be present to win. Bidding in the silent auction will close at the same time. In 2017, a record 625 people attended the sisters’ spaghetti dinner, which raised almost $11,000 to support the Concordia sisters and their ministries. Sister Francis Margaret left directions for her eulogy. It was to be “short, simple and to the point.” In fact, she said that on seven or eight separate sheets of paper, so I think she meant it. While I will try to honor her request, she lived a full and vibrant life and we want to do her justice. Sister Francis Margaret was born at home on July 22, 1932, at 4 a.m. She was baptized the same day she was born. She was the second of eight children born to Frank and Margaret Otter and was given name Virginia Ann. She often said she was welcomed into the family by her parents, older brother Alvin and his pet dog, Daboo. A little over a year later, Sister Mary Esther was born. She was followed by her brother Marion, then Sister Donna and JoAnn. Francis Margaret was six years old when Donna was born. She shared how she felt that Donna was “her baby doll” and how she delighted in helping their Mother care for her. On her eleventh birthday, her youngest sister, JoAnn, was born. She felt like JoAnn was a special gift to her from God. Two other siblings, Rita and Emory, had died at birth. Her ancestry on both sides was German and Irish so her parents were good practicing Catholics. She remembers that they attended two masses every Sunday morning and vespers in the afternoon. They lived on a farm north of New Almelo, Kan., during the Depression years. Because of the drought, the crops were not productive and times were hard; but her parents had deep faith and trust in God. Young Virginia watched her parents during these years and, from their example, learned a deep faith. Yet when the family suffered the loss of the infant children Francis Margaret recalls questioning why a loving God would do this to their family. She began her quest for deeper intimacy with God at a very young age. She continued to be a spiritual seeker throughout her life. As a child, even though times were lean, Sister Francis Margaret said the cellar was always full of canned vegetables and meat. They were well cared for and felt security in their family. Her parents took time to play with the children and she remembers playing softball on Sunday afternoons with her father. Francis Margaret enjoyed sports especially playing softball and basketball. She was the pitcher on Father Sanders’ softball team. I wish to tell you that I want to become one of your daughters. I have attended the retreat given at Marymount College and I believe I have received the wonderful inspiration of that vocation. It makes me happy to think that I want to join the Sisters of St. Joseph. I would like to enter in February. Yours sincerely, Virginia Otter, Clayton, Kansas. Virginia is one of those rare, ideal young ladies, which are rather hard to find these days. She will be a credit to any community. Virginia has never been away from home for any length of time and will probably become very homesick. She professed temporary vows on Aug. 15, 1952, and perpetual vows on Aug. 15, 1955. Her living band member is Sister Gerri Milke. Francis Margaret earned a bachelor degree in social studies from Marymount College in 1965. Over the next several years she took specialized courses in math, reading and the Montessori Method of Education. She took classes from Dayton University in Ohio and San Francisco College in California. Her Montessori training was done in Kansas City, Mo. Her first teaching assignment was at St. Joseph and Anne’s School in Chicago. Her parents had come to Concordia to hear the mission assignments read and they were in Francis Margaret’s word “aghast” when they heard where she was going … here was a very young girl from a very small town leaving for the very large city of Chicago. 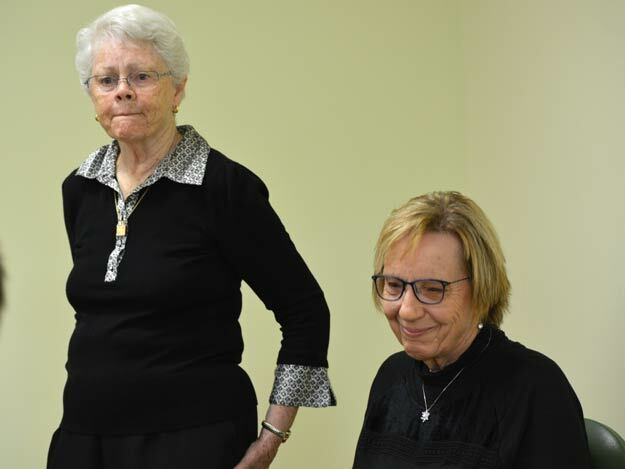 She was blessed that two more experienced sisters, Sisters Franny Jo Hoover and Margaret Jilka, sat down with her every Sunday afternoon to review plans and strategies. She stayed there three years and enjoyed the experience, but never did get used to big city smog and noise. From 1953 to 1995, she taught first grade and primary grades in Chicago; Concordia, Manhattan, Junction City, Herndon, Oakley and Plainville, Kan.; and El Paso, Texas; and was responsible for starting Montessori kindergartens in Leawood and Salina, Kan.
Francis Margaret was a marvelous teacher. It is unbelievable how many certificates she earned in courses with titles such as “Motivating the Unmotivated” and “Teacher as Poet.” She had a passion for teaching and kept striving for the more, always wanting to better her skills so that she could reach even the hardest to reach child. Francis Margaret won a grant from McDonald’s for a hands-on math lab. She wanted children to be able to understand abstract math concepts and was innovative in creating ways to do that. Her students, in turn, loved her. On her 25th Jubilee, her school set aside a special day to celebrate with her. A first grader wrote her a congratulations card. She printed it in block letters on the lined paper children used when learning to print. It read, “I hope you have a good 25th year day. 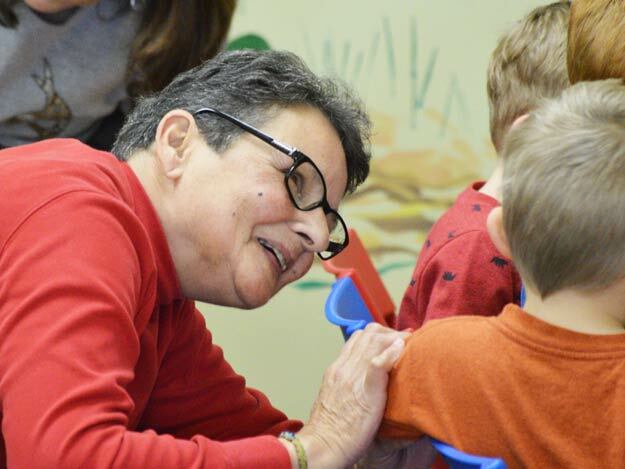 Twenty-five years is a long time and I have missed quite a few of your anniversaries but I sure hope that this one is just wonderful.” — signed Diane G.
After 43 years she moved from teaching and became the religious education coordinator at Sacred Heart Parish in Plainville. She remained in that position for nine years before retiring from active ministry in June 2005. Francis Margaret had a zest for life. 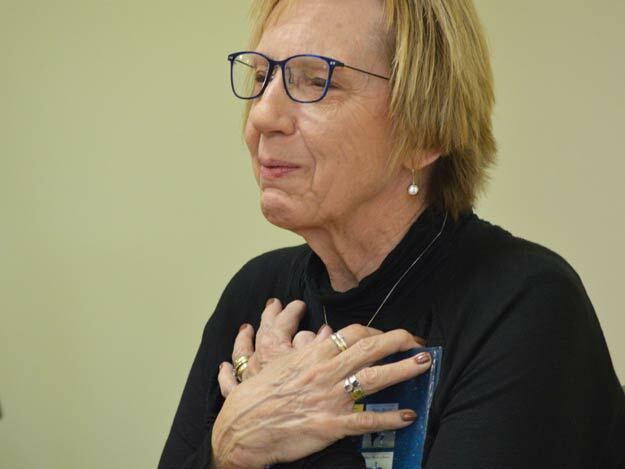 During these years, she also spent one summer as a staff assistant at a L’Arche Home for special needs adults in Winnipeg, Canada, went to Brazil to celebrate the 25th anniversary of the mission there, and became certified in Facilitative Family Ministry. That was a ministry to mobilize and educate people on how to find needs of parishioners and be responsive to them. When she came to the Motherhouse, she continuing to serve in a wide variety of ways: giving tours, leading the Rosary and Litany, distributing mail, preparing food trays for sisters, helping with recycling and handcrafting items for the Nazareth Gift Shop. Each year we give a tour to local fourth graders as part of a class project. Sister Francis Margaret was a tour guide par excellence with that age group. She delighted in doing that. She had a heart for vocations and offered to be on the vocation committee and would give talks and accompany the vocation directors to Vocation Day Events. So, in her honor — I’m sure she would want me to do this — I’m going to put a plug in here for any single, Catholic women who are here to consider becoming a Sister of St. Joseph. Francis Margaret had an awareness of what needed to be done. She did not need someone to point it out or tell her. For example, around the Motherhouse Sister Mary Leo was legally blind so she read the “Connections” to her, which is our internal newsletter. She did sewing for others, made gifts for our gift shop and even gave Sister Mary Esther an Ogilvy home perm every three months. She could be found in prayer at various times of the day or night, in various locations in the house. She prayed the rosary, prayed in the office, meditated on Bible verses and more. Francis Margaret also enjoyed life and made sure she had time for recreation. In addition to reading and working puzzles, she liked to play pinochle and pitch. Her pitch partners shared that they enjoyed her quick wit and they also knew she would never bid over five. From young adulthood she began suffering from seizures. That was a cross she bore admirably. She said that it limited her freedom of activities but she adjusted well and compensated for it when she could. Her life was filled with gratitude. In her file there are several notes that she sent to past councils and various committees graciously thanking them for their work. She wrote one to Sister Polly Kukula responding to a story about Sister Polly on our webpage which had a photo of Polly in the classroom. That was Francis Margaret. She wanted to spread joy and encouragement wherever she was. It was important to her to be able to laugh and to show appreciation. Sister Francis Margaret had an unquenchable thirst for God. Like a true Sister of St. Joseph she was always yearning for “the more” and unreservedly gave herself in service to others. As we heard in the Scripture reading, “Yes,” said the Spirit, “let her find her rest from her labors for her works accompany her.” We have all been enriched by Francis Margaret’s life among us. For that, we give thanks to God. 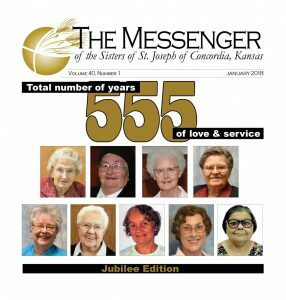 The January edition of The Messenger is always an exciting one, because we begin a celebration of our Jubilarians! And 2018 brings us nine wonderful women whose combined 555 years of service deserves to be celebrated. Yet that’s just the beginning of the news and information packed into this edition. You can also learn about changes on the Motherhouse grounds, Sisters being honored for their service and ministries and upcoming events for the new year! The book was, “On the Night You Were Born” written and illustrated by Nancy Tillman. And the reading was Dec. 8 at Neighbor to Neighbor, as part of the ongoing Reading with Friends series. The book tells of all the wonderful, fanciful things that happen on the night a baby is born. 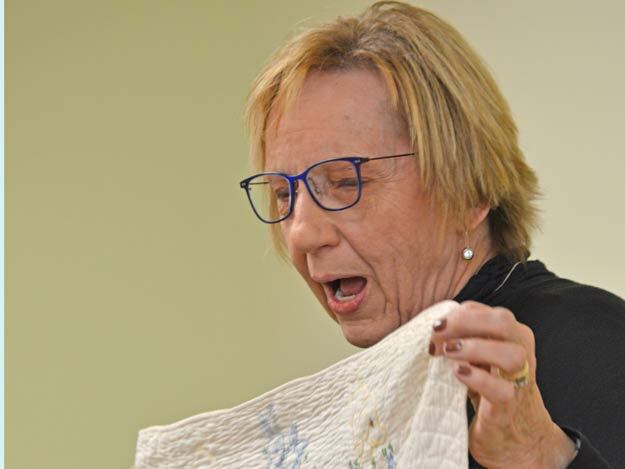 After reading the book with the children, Hosie shared a quilt that her mother gave her as an infant. 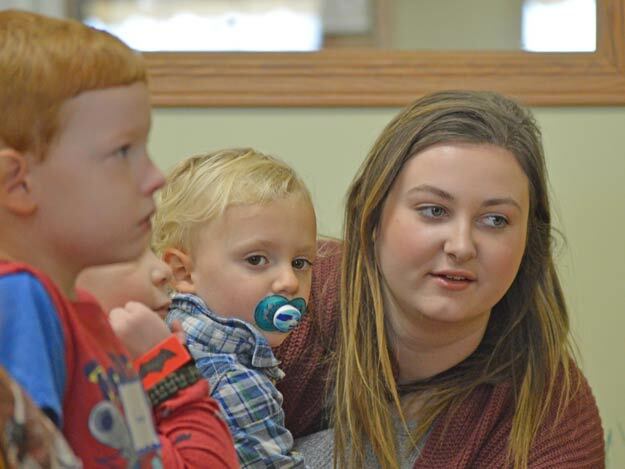 Reading with Friends offers story times for children 3 to 5 years old on the second Fridays of the month at 10 a.m. at Neighbor to Neighbor, 103 E. Sixth St. Each session includes playtime and a snack for the children, plus each child receives a free copy of that day’s book to take home. There is a limit of 30 children per session so parents must register in advance. This was the third “Reading with Friends” program this fall. The monthly program has been a part of Neighbor to Neighbor’s regular offerings since September 2012. The next date will be Jan. 12, 2018. To make reservations for January’s story time, call Neighbor to Neighbor at 785/262-4215 or email neighbortoneighbor@csjkansas.org. This year’s Reading with Friends is made possible thanks to a generous donation from Betty Drake of Beloit. 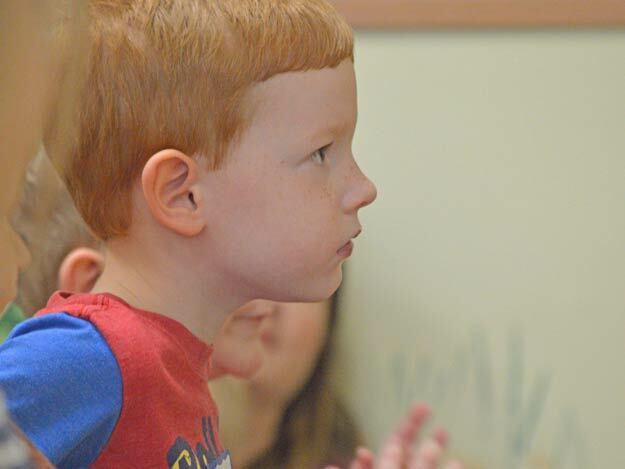 Do you know a very special preschooler? Then treat them to a free reading of “The Night You Were Born,” a book that celebrates the uniqueness of every child, at the next Reading with Friends at Neighbor to Neighbor. The birth of a baby —”the one and only ever you” — causes jubilation throughout creation in this quietly celebratory picture book by writer and illustrator Nancy Tillman. 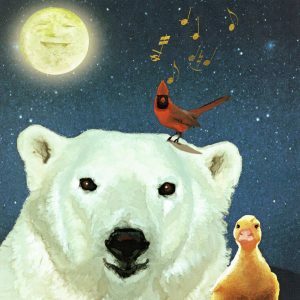 Story time will begin at 10 a.m. Friday, Dec. 8. Margo Hosie will be the guest reader. 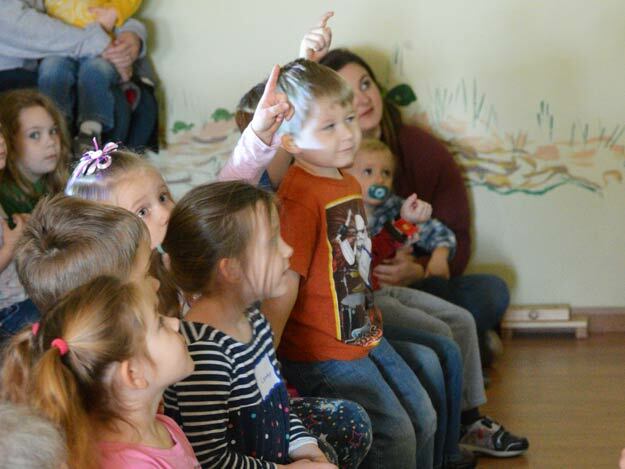 The story times for children 3 to 5 years old are all on the second Fridays of the month and all begin at 10 a.m. at Neighbor to Neighbor, 103 E. Sixth St. Each session will include playtime and a snack for the children, plus each child will receive a free copy of that day’s book to take home. There is a limit of 30 children per session so parents must register in advance. Call Neighbor to Neighbor at 785/262-4215 or email neighbortoneighbor@csjkansas.org. 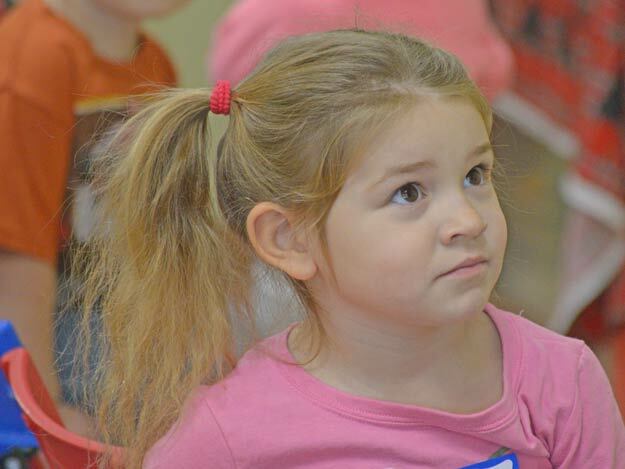 This is the third “Reading with Friends” program scheduled this fall. The monthly program has been a part of Neighbor to Neighbor’s regular offerings since September 2012. Upcoming dates will be Jan. 12. In the new year, the program will continue through May 2018.